Happy 4th of July!! Ok, two days early, but I won’t be around much for the next 5 days. My beautiful little girl turns 4 on Saturday, we are going to have a cookout party here at the house for her, which means I have today, tomorrow, and Friday to clean, grocery shop, prepare appetizers (what to make, what to make??). On the 4th we will likely go to a local park during the day, and then do some small fireworks here at night. Today’s guest post comes from my great friend Becca from It’s Yummi!. Becca and I “met” soon after I started blogging, and I’ve grown to love both her and her recipes! I even made her Bacon Burger Stuffed Peppers, and they were great 🙂 Today she is sharing a great dessert for 4th of July, so let’s get to it, shall we? When I heard that my sweet friend “Crazy” was looking for a few bloggers to help her out with guest posts during her crazy busy summer, I jumped all over the opportunity. She’s got a huge heart and is always helping out others, so I wanted to be first in line to toss some love right back her way! Bernadette is a busy mom, and I’m guessing that many of you may be as well. My kids are all grown up, but that’ll never stop me from making quick and easy recipes to help keep my kitchen time manageable. 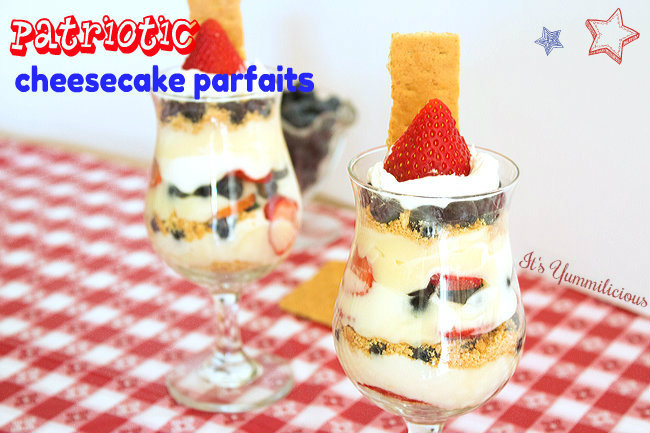 This cheesecake parfait recipe is as quick and easy as a make-it-yourself dessert gets. I hope you have a safe and happy 4th of July celebration! Chef, baker, and happiness maker at It’s Yummilicious! In a large bowl, whisk pudding mix and milk together for 2 minutes; Set aside for 5 minutes and allow pudding to set. Meanwhile, place graham cracker sheets into a zipper-top plastic bag. Close bag and use a rolling pin or your hands to crush the crumbs finely. Place 2 tablespoons of crumbs into the bottom of each parfait glass. When pudding has set, use a whisk or wooden spoon to gently fold half of the whipped topping into the pudding. Layer 3-4 strawberry slices on top of the crumbs. Add 2-3 tablespoons of whipped topping on top of strawberries and use back of spoon to spread topping evenly. Add enough blueberries to cover whipped topping. Layer 3-4 tablespoons of pudding mixture over blueberries. 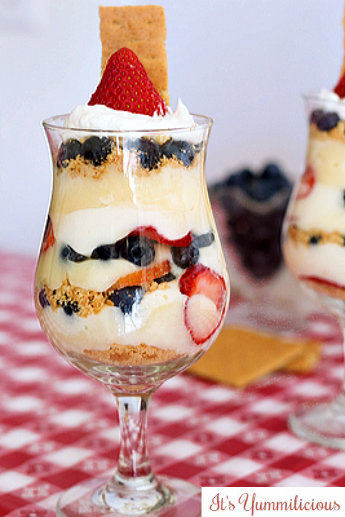 Repeat with additional layers of crumbs, strawberries, whipped topping, blueberries, and pudding mixture until the parfait glasses are full. Garnish with additional whipped topping and fruit if desired. I sure hope you ladies saved some for me, cuz I’m coming over!! Looks delicious…enjoy your time away, you’ll be busy, but sounds like a good time. Happy Birthday to your little girl.